The usual suspects you would normally find in a weizen: bready malt, cloves, citrus, bananas and something very unique...chamomile! Yes chamomile. This beer is brewed with that tea-friendly flower, chamomile. You can notice it in the smell but it's in no way overpowering nor does it detract in any way from the smell. Rather it lends a nice subtle spiciness. Appearance: Pours a golden yellow with only a slight haze from the suspended yeast. Nice fluffy, white, two finger head that receded down to a thick film leaving behind some decent lacing. Smell: The usual suspects you would normally find in a weizen: bready malt, cloves, citrus, bananas and something very unique…chamomile! Yes chamomile. This beer is brewed with that tea-friendly flower, chamomile. You can notice it in the smell but it’s in no way overpowering nor does it detract in any way from the smell. Rather it lends a nice subtle spiciness. Initial Taste: There is not a lot going on after the first couple of sips. The main flavor that jumps out is that bready malt that is always so evident in this style of beer. There is some subtle flower-like flavor from the chamomile that adds an extra depth to the beer. The beer finishes dry with a nice crisp hop bitterness leaving you with a soft citrus aftertaste. Thoughts: Being a fellow New Hampshire man it’s hard for me not to support this brewery. Based out of Portsmouth NH this brewery has concocted some of the highest rated beers in the industry. So these guys certainly know what they are doing. With that said I don’t think this beer is one of their best. I applaud them for trying something different by adding chamomile into the brewing process but sadly it doesn’t help this beer stand out against its sister beers. However, compared to most other weizens this is a very decent beer. The flavor is soft and light with a nice clean finish that lets this beer be a great session choice. 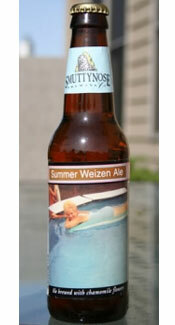 The crisp hopiness and fruity citrus make this brew very refreshing and perfect for those sticky-hot summer days. I highly recommend. Cheers!